Author: Alfred Barton Rendle 1905. Synonyms: Ipomoea tuberosa Linnaeus 1753. Operculina tuberosa, Meisn. 1869. Batatas tuberosa, Bojer 1837. Convolvulus dissectus Jacquin 1767. Convolvulus gossypiifolius Kunth 1818. Convolvulus kentrocaulos Steud. ex Choisy 1845. Convolvulus macrocarpus Spreng. 1825. Convolvulus tuberosus, Spreng. 1825. Ipomoea dissecta, Pursh 1814. Ipomoea nuda Peter 1891. Ipomoea sinuata Ortega 1798. Merremia dissecta, Hallier f. 1893. Merremia kentrocaulos, Rendle 1905. Operculina dissecta, House 1906. Operculina kentrocaulos, Hallier f.
The dry fruits. "Wood Rose". This member of the Convolvulaceae family was given this name by Alfred Barton Rendle in 1905. 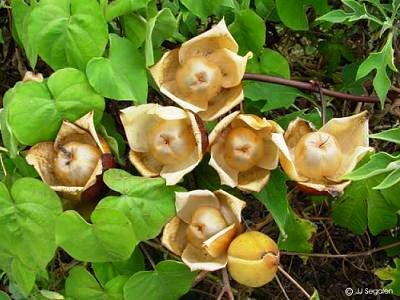 It was originally found in the tropical America, but has now been spread to other tropical areas i.e. Hawaii, Southern Florida, Southern India and Ceylon. It grows in forests in peat with lots of water and some sun. 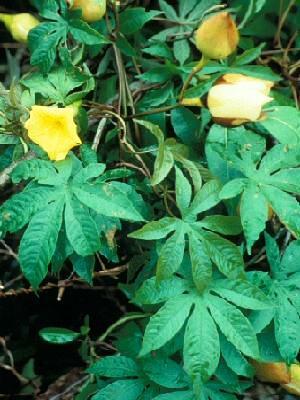 The climbing vines will grow up to 20 meters, the flowers are bright yellow.